Caring for racehorses is in our blood. We are committed to ensuring the highest quality of life pre, during and post-racing careers. below are the facts to show that our endeavours are successful. 1. There are more than 70,000 people - owners, trainers, jockeys and stable staff - who actively participate in thoroughbred racing in Victoria. Each has a passion for horses and many have spent a lifetime caring for them. 2. Thoroughbred racehorses are elite athletes who receive elite care with an average of $35,000 spent on the training, care and welfare of each racehorse annually according to the ATA. 3. With close to 9000 racehorses competing in Victoria annually, over $300 million is spent each year in this state alone by owners on the training, care and welfare of the racehorse population. 4. Each year more and more everyday Victorians are enjoying owning a thoroughbred racehorse with family and friends. In fact the number of owners has grown by around 80% since 2006. With many taking just small shares in racehorses, it is the experience; enjoyment and passion for horses that are the greatest attraction. 5. Training racehorses is a challenge. Only those with a love of the animal are committed to year round 3am starts and long hours as they pursue their passion to work with horses. 6. Fewer foals are being born each year, but a greater percentage of them are making it to the racetrack with the care and attention being afforded throughout their formative years by owners, breeders and trainers. Over the past 10 years, the number of foals born nationally has dropped by more than 23.5% to 13,675, whilst the number of horses competing has remained relatively constant. 7. A recent study of foals born in Victoria in 2005 by Dr Meredith Flash found that 74% of them entered training. Of these, 93% progressed to racing or an official trial. Of those that did not make it to racing some were retained in breeding, some died by natural causes or accident and others were rehomed directly to pleasure and equestrian pursuits. Identical research projects have been commissioned for the 2010 and 2015 foal crops. Preliminary results from 2010 born foals are consistent with the 2005 born foals. 8. The research showed that while 35% of horses started training as 2YO’s, only 13% of 2005 and 2010 born foals actually raced. Our trainers are exercising their judgement of the readiness of each horse before entering it in a race. 1. Victoria’s horse safety record over the last 10 years is among the best in world thoroughbred racing and the industry is committed to maintaining world’s best practice. 2. Like many sports, thoroughbred racing is not without risk. The sheer size and power of racehorses means that on rare occasions they suffer injuries that cannot be repaired. Through welfare initiatives, extensive research and investment in infrastructure, the industry is continually striving to provide the safest racing environment. 3. The total number of flat starts in Victorian racing has averaged 42,614 per year since 2005. During that same period, the horse safety record has averaged 99.95% with fatal racing accidents occurring in just 0.05% of starts. 5. Victoria leads the world with its commitment to drug-free racing. Raceday treatments have long been banned and medication controls have been strengthened on treatment in training including a complete ban on anabolic steroids. Racing Victoria spends $1.8 million annually on medication control. 6. Investment is being made to provide the safest possible racing environment with more than $25 million invested in plastic running rails and building safer racetracks over the past five years. Tracks are inspected daily by officials to ensure they are safe for racing. 7. The industry is not resting on its laurels. Racing Victoria is embarking on a $5.25 million research project with the University of Melbourne, the Victorian Government and Racing Australia aimed at the prevention of equine limb injuries. 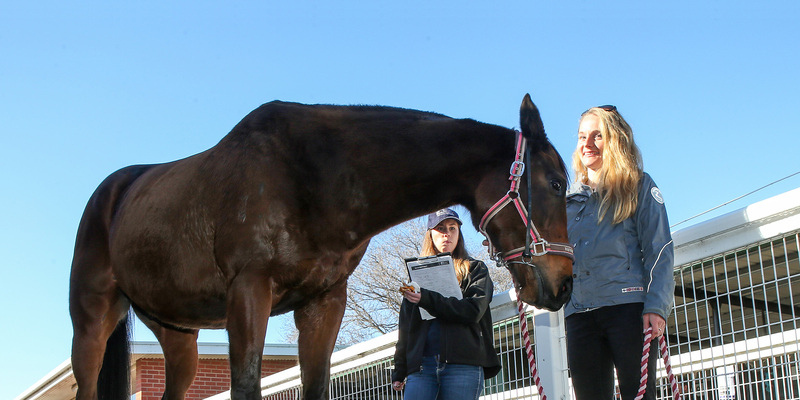 Over the past 20 years, it has also funded countless research projects by the Rural Industries Research and Development Corporation to assist the health and wellbeing of Australia’s entire horse population, not just thoroughbred racehorses. 1. The industry has a retirement rule which requires owners to notify authorities the reason why their horse has been retired and its whereabouts post-racing. Statistics over the past three years show that 90% of horses leaving the racing industry are re-homed directly to the equestrian, pleasure or breeding industries. 2. Racing Victoria believes there is a home for every healthy racehorse and the industry and its participants are working to suitably re-home them into a post-racing career, be it for pleasure, polo or professional equestrian disciplines. 3. Racing Victoria’s Off the Track program is an active voice in the racing and equestrian industries, promoting the versatility, athleticism and suitability of retired racehorses for a variety of disciplines and pursuits, whilst supporting 60 acknowledged re-trainers. 4. Since its inception in 2012, the Off the Track program has supported the equestrian community through the sponsorship of more than 500 competitions and clinics in which over 11,000 retired racehorses have competed within. 5. There were more than 65 retired racehorses competing in equestrian events at the Royal Melbourne Show in 2017 with former John Symons/Guy Walter-trained racehorse Crosswind (now SLM Mercedes) winning the prestigious Garryowen Turnout. This is the seventh year in a row that the Garryowen has been won by a retired racehorse. 6. Retired racehorses are in demand. A 2013 University of Melbourne study showed that thoroughbreds with a link to racing are the most represented breed among the 600,000 pleasure horses in Victoria. 7. Racing Victoria attends and monitors the presence of thoroughbreds at all major horse and livestock sales across the state. This includes identification of retired racehorses via their microchip and/or brands, the provision of this information and facilitating the purchase of horses by legitimate buyers. Flash, M.L. Epidemiology of Thoroughbred Racehorses entering and leaving the Victorian Racing Industry, University of Melbourne, Victoria, 2014. Racing Australia, 2016, Australian Racing Fact Book: A Guide to the Racing Industry in Australia 2015-2016, Racing Australia, Australia.